The rangeomorph Vinlandia was initially described as a species of Charnia (Charnia antecedens) before being recognised as its own genus. Vinlandia differs from Charnia in having a less regular pattern of primary branches, and branches that appear to radiate at the outer edges, rather than the more uniform margin seen in Charnia. Like Charnia, Vinlandia displays furled branches at every observable order and often the basal holdfast is not preserved, perhaps suggesting the holdfast was buried in the sediment rather than sitting on top of it. 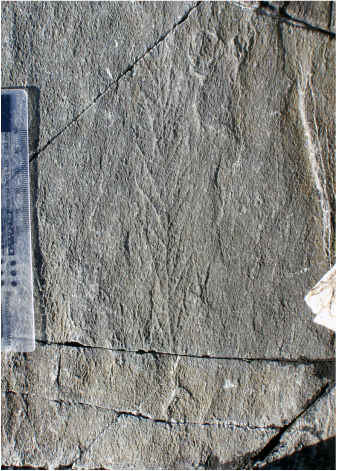 Together with Charnia and Trepassia, Vinlandia is amongst the oldest of all members of the Ediacaran biota, with the first specimens appearing in the fossil record around 570 million years ago. spaced primary branches, arranged alternately along a furled central axis, forming a linear to zig-zag suture. Inflation of first- and second-order branches is moderate to medial. First- and second-order branches are arranged in radiating to subparallel series. All first- to third-order branches have furled margins, with rangeomorph elements that are rotated and undisplayed. A basal disc is rarely preserved.